Australian bred racehorses put on a parade at home and aboard on the Australia Day long weekend with Inglis graduates notching up stakes victories in Melbourne, Sydney, South Africa and Hong Kong. Fontiton, Burnstone, Shamal Wind and Mourinho won black type in Melbourne, Ninth Legion scored at stakes level in Sydney, while Alboran Sea and Able Friend both recorded their second International Group 1 wins when successful in South Africa and Hong Kong respectively. Fontiton and Burnstone made it a Blue Diamond Preview double on Australia Day, Monday 26 Janaury, matching the feat of subsequent Group 1 winning Inglis graduates Rostova and Reward For Effort in 2009. Today's winners were sold as Lots 460 and 381 at last year's Inglis Premier Yearling Sale. The win of Fontiton (Turffontein x Personal Ensign) in the Group 3 MRC Blue Diamond Preview for fillies ensured the Robert Smerdon trained galloper remained the undefeated favourite for next month's $1 million Group 1 MRC Blue Diamond Stakes. Fontition was a $110,000 purchase by Matchem Racing from the draft of Blue Gum Farm at the 2014 Inglis Premier Yearling Sale. Burnstone (Redoute's Choice x Merlene de Lago) defied his $40,000 Inglis Premier Yearling Sale price to romp away with the Listed MRC Blue Diamond Preview race for Colts and Geldings. Bought by Robbie Griffiths from the Arrowfield Stud draft Burnstone has a serious stallion's pedigree to go with his two-year-old black type victory. 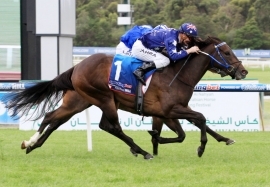 Shamal Wind (Dubawi x Firemaid) scorched over the 1000m at Sandown in Melbourne to win the Listed MRC W.J. Adams Stakes, the same race she won last year. The Robert Smerdon trained mare was a $55,000 purchase from Widden Stud's draft at the 2011 Inglis Premier Yearling Sale and has earned $590,000 on the racetrack. Mourinho (Oratorio x Benevolent) won the Group 2 MVRC Australia Stakes over 1200m at Moonee Valley on Saturday to take is earnings past $800,000, which is a tremendous return given the galloper was a $36,000 purchase by part owner Leo Tartaglione for the draft of breeders Little Wych at the 2009 Inglis Classic Yearling Sale. Ninth Legion (Fastnet Rock x Xaar's Jewel) produced a strong first up performance to claim the Listed ATC Carrington Stakes over 1400m at Randwick on Saturday. The Segenhoe Stud raced galloper has returned $645,000 in racetrack earnings to date following his purchase from the draft of Edinglassie Stud at the 2011 Inglis Australian Easter Yearling Sale for $110,000. Alboran Sea (Rock of Gibraltar x Lady's Light) added the Group 1 Kenilworth Cape Flying Championship on Saturday to her expanding resume, which already included the 2014 Group 1 Scottsville Allan Robertson Championship. Trained in South Africa by Mike De Kock, Alboran Sea is a winner of four from eight starts for owners Michael Javett and Mary Slack following the filly being bought from Rosemont Stud's draft at the 2013 Inglis Premier Yearling Sale for $105,000. Able Friend (Shamardal x Ponte Piccolo), the co-third best horse in the world in 2014, recorded his second International Group 1 victory with ease on Sunday when simply dominant in the 1600m Stewards' Cup at Sha Tin. The John Moore trained star has won HK$36,444,750 (=A$5,500,000) having been purchased by George Moore Bloodstock for $550,000 from the draft of Able Friend's breeders Turangga Farm at the 2011 Inglis Australian Easter Yearling Sale.